It's mine....All mine....,HA HA ha aha ha...! This one has eyes that are bigger than his stomach, and he says, better luck next time Cyril.....lol. I have two hickory nut trees in the yard so I've learned the hard way about holes already....lol. I should go out and take a photo of some of their handy work in my flowerbeds, you'd be quite impressed....lol Now If I could just get them to dig daffodil bulb holes for me on demand I'd be rich. How did you get to be so smart anyway....lol. Great idea ! Problem now is, I have way more holes than I have bulbs to fill them...will have to rectify that little problem soon....he he he ! Yea, I believe they can smell the delectable little bulb morsels from a mile away...That's why I plan on training them to dig daffodil bulbs, one of the few they won't touch...(giggles) Genius idea, (patting myself on the back as we speak....lol ) I promise to remember you when all the money starts rolling in....lol. Suppose what it really means is no ones gonna walk through your door and hand you a fortune so guess we ll just have to carry on working, Unless of course your squirrel strikes oil with all that digging ! Always great to hear from you - getting late here now so time to say goodnight x Best wishes to you and Roger. Has he got a little flapjack? I know they say don't feed wildlife...but this is so so cute! Great photography! Tastegy, it's the bottom half of a hamburger bun , that has peanutbutter spread on the other side. Instead of throwing my old bread out with the trash, I give it to them with a treat on it . What a great photo Flc. What a greedy little fella he is....lol. He knows a good billet when he sees one! Got you well trained. Thanks Gilli, I've become the fast food drive thru around here. Great photo, the only way it could be improved is for the subject to be a RED squirrel...! And in this country they call them tree rats. So unkind. Really good photo. Thanks for sharing. Thanks Fleurdemai and Toto. Glad you liked it ! Agree with Toto...our Cyril would be so offended..! Thanks Penny and Frog, they're antics make funny photos easy to get. Hilarious. He is so pleased with his catch. Little did he know the whole world would see.....lol. Beautiful animal shot and just so funny! Maybe we should suggest the Grows On You calendar! Thanks Lori and Robert, hate I had to out the poor fellow, but I caught him red-handed....lol . OMG! Can't get left out of this one! Fantastic shot!! I identified the object right on too as the bottom half of a hamburger bun!! What a great shot and such a threat to the fame of Cyril!!! lolol! Move over Cyril! No threat Polly...Cyrils got other things on his mind....busy in his drey with Twiggy ! lol His bachelor celebrity status days are over .....now hes a family on the way !! Cyril is now a definite "Family Guy", is he still nest building BB? Yes Dawn...only comes out a couple of times a day now....takes monkey nuts into the drey,for Twiggy ! Ohhhh bless him. He's turned out to be a wonderful husband! So monkey nuts are on the shopping list now then, ha ha. Way to go Polly, for guessing it right ! 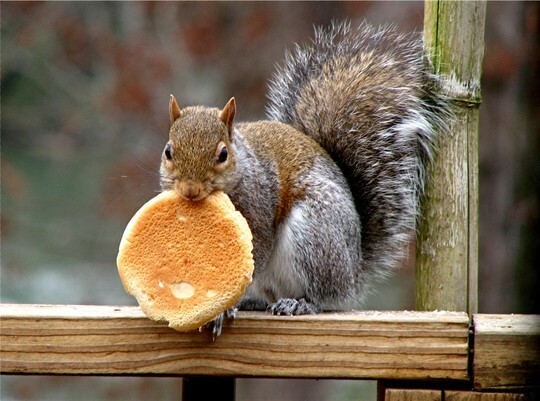 Don't worry, my little bread thief is just filling in for Cyril for a little while, because Cyril's real busy right now with his 'honey do ' list...lol. Lovely portrait. Seen the other photos in your gallery -- very very nice. What camera and lens(es?) do you use? Thanks Jeremy for the kind comments, all credit goes to the Canon PowerShot S3IS. Hubby bought me a Canon telephoto zoom lens for Christmas, but I haven't uploaded any photos taken with it yet. Really, these digital cameras produce very good results in the hands of a competent photographer. The eyes. You've got to focus on the eyes and you did. Good stuff. Thanks for the nice comments, they certainly have spiced up my dull winter days ! Thanks Lori, I get lucky on rare occasions. Hello Mr. Squiz ! He's a beauty !